Place chicken in a gallon size Ziplock bag and add balsamic vinaigrette to cover. Smoosh out the air as you zip it closed and place in the fridge for 1 1/2 - 2 hours to marinate. Once it has marinated, place in a lightly greased baking dish, add another splash of fresh vinaigrette over the top and drizzle with honey. Bake at 350˚F for about 45 minutes, or until cooked through. Heat your oven to 350˚F. Quarter the Apple Pears and remove the cores. Place in an 8x8 inch baking dish. Add 1/4 cup of water, 3 Tablespoons of vanilla, and drizzle the tops with agave. Bake for 10-15 minutes until slightly tender. Remove from oven and cool slightly, then slice each quarter into 4-5 thin slices. If you plan on serving them cool, go ahead and put them in the fridge at this point. Chop up all your mushrooms. In a skillet over medium heat, sautee your garlic and butter until melted together, then add the chopped mushrooms. Sautee until tender, 2-5 minutes. 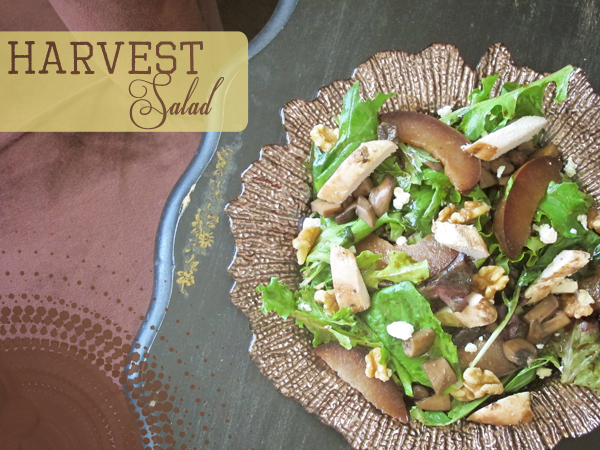 Toss together the mixed greens, walnuts, feta, Sautéed mushrooms, and Roasted Apple Pears with a Balsamic Vinaigrette dressing (try mixing it up with a flavored version such as Vanilla Fig Balsamic or Fig & Walnut Balsamic for a fall-infused flavor boost). You can either serve the Honey Balsamic Chicken as your main entrée with the salad on the side, or chop up the chicken into bite-sized slices and serve on top.